What do you get if you combine the popular SMOK Alien mod and the new Skyhook RDTA? 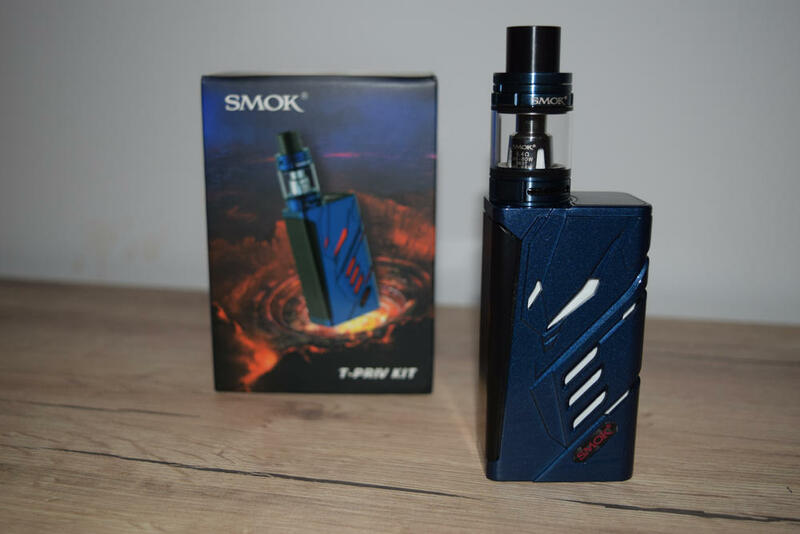 That would be the SMOK Skyhook RDTA Box, a new all-in-one device that features a maximum power output of 220W, a rebuildable atomizer and a built-in e-liquid reservoir with a capacity of 9 ml. 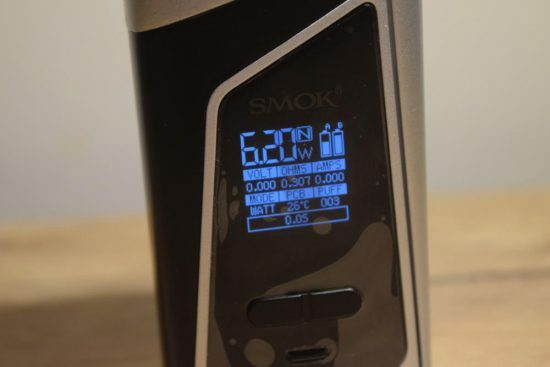 It’s essentially the same concept we’ve already seen on the iJoy RDTA Box, so in this review we’re going to take a look at what the SMOK brings to the table to convince buyers to choose their device over iJoy’s impressive flagship. 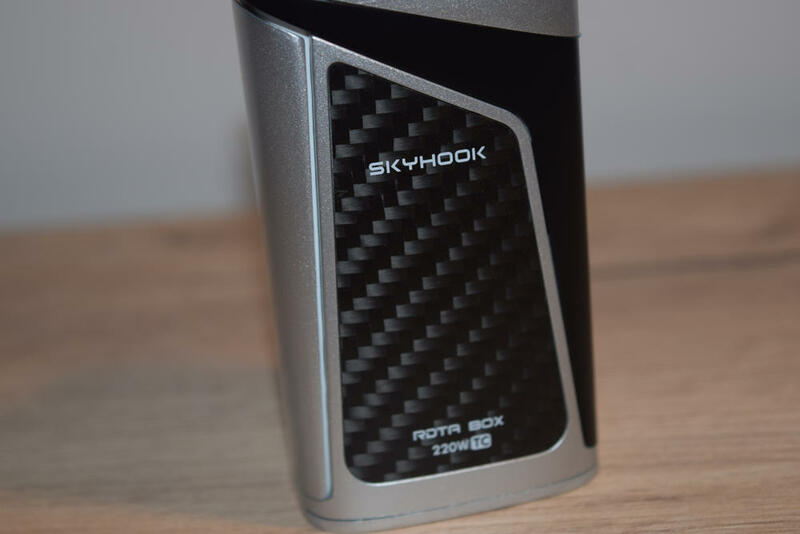 The Skyhook RDTA Box comes in the usual SMOK packaging, a large rectangular box with a paper wrapper featuring a picture of the device on the front and an impressive-sounding description of it on the back, as well as all the usual warnings and legal disclaimers. Inside the kit, we have the assembled Skyhook RDTA Box sitting snug in a foam holder, and underneath that are a micro-USB charging/upgrade cable, a spare RDA tube, a silicon plug for single-coil vaping, some organic cotton, a bag of spare parts (o-rings and grub screws), an Allen key and a user manual. SMOK also includes two 3.5 mm fused Clapton coils that come pre-installed in the built-in Skyhook RDTA. They have a combined resistance of around 0.4Ω. As usual, the kit does not include 18650 batteries, so you’ll have to purchase a couple of them separately, if you don’t have any. The SMOK Skyhook RDTA Box is 130 mm long, from the very bottom of the mod to the top of the Delrin drip tip, 50 mm wide and just over 30 mm thick. That makes is 5 mm shorter and 5 mm narrower than its direct competitor, the iJoy RDTA Box. That may not seem like a big difference, but looking at the two devices side by side, the Skyhook comes across as considerably smaller. The rounded edges and overall slicker design of the SMOK mod play a part in that as well. But it’s the difference in weight that I found most surprising. With two 18650 batteries inserted, the SMOK Skyhook RDTA Box weighs 316 grams, while the iJoy RDTA box is a whopping 445 grams heavy. So as far as portability and ergonomics are concerned, the Skyhook seems to be the better choice. Design-wise, the SMOK Skyhook RDTA Box doesn’t look exactly like the Alien 220W mod, but you can clearly see that it was definitely inspired by it. The shape, the firing bar, the battery door, the large display are all the same as the Alien, but this all-in-one device is visibly larger, mainly due to the built-in 9 ml tank on top. The Skyhook RDTA Box is primarily made of stainless steel, which is a bit surprising, as the vast majority of SMOK mods I’ve used in the past were made of zinc alloy, and comes in a variety of colors and finishes. The Chinese company sent me the grey and black versions for this review, but there are a total of eight different color combinations to choose from. As I mentioned, the finish is different depending on the color, as well. For example, the grey one has a matte finish, while the black one is glossy, which makes it more of a fingerprint magnet. So take a good look at them before you pull the trigger. Just like the SMOK Alien, the Skyhook has a large OLED display on one side and a high quality carbon-fiber sticker on the other. 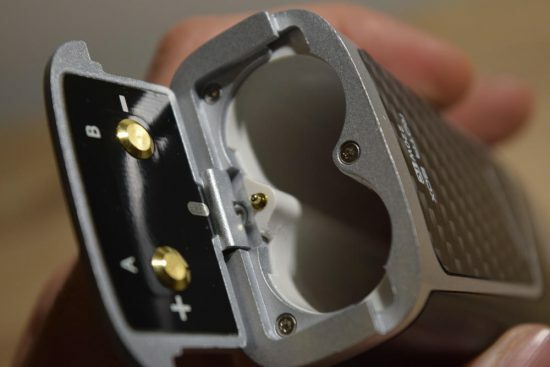 The battery door on the bottom of the device is hinged and locks in place when pressed down on the batteries, the firing bar is nice and clicky, just like that of the Alien, and is very comfortable to operate. The tension of the bar is just right, so that you don’t end up accidentally firing when holding it, but neither does it require too much pressure to activate. 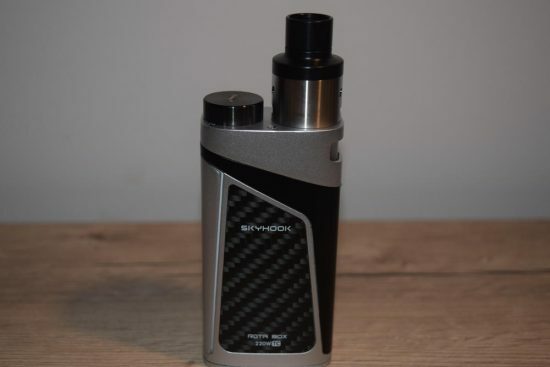 But what really sets the Skyhook RDTA Box apart from the Alien is the top section – the massive 9 ml e-liquid reservoir and the Skyhook atomizer sticking out of it. 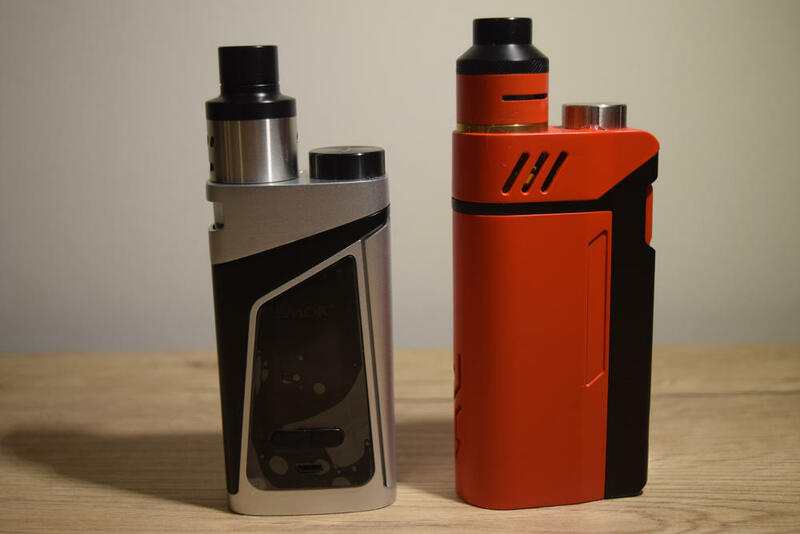 The tank features the same style fill-port as the iJoy RDTA Box – a large round hole with a screw-on metal cap, and seems to be made entirely of a translucent plastic. I’ve heard other reviewers say that the bottom of the tank is not perfectly flat, but tilted toward the atomizer side, for better wicking, but I for one can’t tell for sure. It certainly looks flat to me, and I didn’t see the juice flowing toward the atomizer, but I don’t see that as a big deal, as I usually hold the mod tilted when vaping, to ensure that the e-liquid reaches the cotton. The tank also has a large window to help users keep an eye on the juice level, but I can’t figure out why they opted for frosted plastic, instead of a clear one. You can tell how much juice is in the reservoir through the window, so that’s good, but clear plastic would have been much better. The Skyhook RDTA built into this all-in-one vaporizer is essentially the same one you can buy separately for use with other mods, and which we already reviewed recently. The only major differences are that this one can only be used as part of this RDTA box, and the filling system. The original Skyhook RDTA has a frustrating fill port positioning, where the cotton wicks just get in the way, but you don’t have to worry about that here. SMOK’s first RDTA box has the exact same display as the Alien 220W mod, which just happens to be one of the best I’ve ever seen. It’s larger than you typical mod screen, and features all the information you need – wattage/temperature, an icon for the pre-heat mode, individual battery indicators, real-time voltage, atomizer resistance, amperage, current mode, board temperature, puff counter and puff timer. What more could you ask for? As I’ve noticed with other SMOK mods in the past year, the OLED display is also significantly brighter than it used to be on say the Good ol’ X Cube 2. And unlike the Alien, the SMOK RDTA Box also comes with a peel-off screen protector. The menu system is also more of the same, which is not a bad thing at all. The Alien remains one of the best and most popular advanced vaporizers on the market right now, and for good reason, so the fact that SMOK implemented the same technology into the Skyhook RDTA box is actually a positive in my book. You can access the menu by pressing the fire bar three times in rapid succession. There, you’ll be able to browse through the main options – vaping mode, puffs, settings and power on/off – with short presses of the firing bar, or access the submenu of each one by keeping the fire bar pressed for at least one second. It’s a really intuitive menu navigation system, and even though SMOK is known for its somewhat convoluted menus, it’s quite easy to figure out, especially if you’ve ever used another device made by the Chinese company. In the “Mode” menu, you can select between wattage mode, temperature control and memory mode. For wattage mode, you can select between various pre-heat settings (minimum, soft, normal, hard and maximum) , in temperature control you can select from three supported coil materials (nickel, titanium and stainless steel) adjust the initial wattage and the TCR, and in memory mode, you can customize and choose from up to 22 different settings. This last one is very useful if you have several atomizers and don’t want to change the wattage/temperature every time you switch. You can just select one of the memory modes. In “Puffs”, you can reset the puff counter and set a maximum puff limit, if you feel like you’re vaping too much. Once you reach a set number of puffs, the device won’t fire anymore. 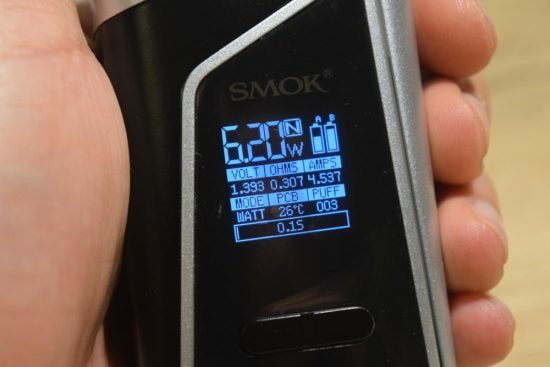 In “Settings”, you can adjust the time that the display stays on after each puff, adjust the display brightness, lock the screen buttons to avoid accidentally adjusting the wattage/temperature, adjust the resistance of the atomizer and download system updates. Finally, the “Power” menu lets you turn off the device to conserve battery life. 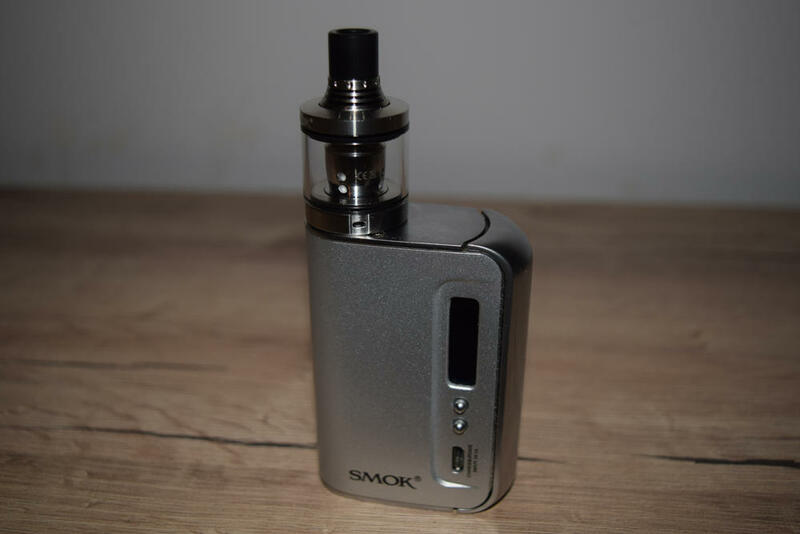 As I said, I found the SMOK menu very easy to navigate, but that’s probably because I had plenty of experience with other devices made by this company. 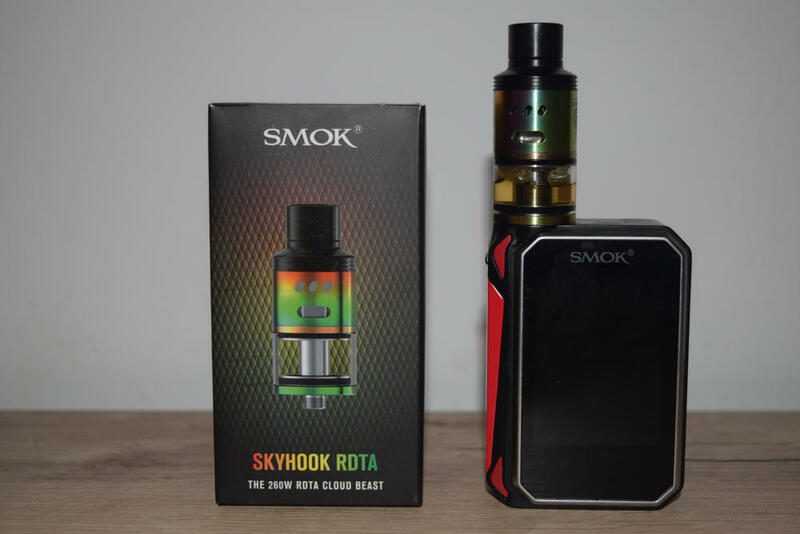 This is usually a review section reserved for tanks and other atomizers, but since the SMOK Skyhook RDTA is an all-in-one device, I found it appropriate to talk about its vaping performance. I should start out by saying that I have only used it with the pre-installed fused Clapton coils provided by SMOK, so if you’re planning on using your own fancy builds, all this will probably be less relevant. 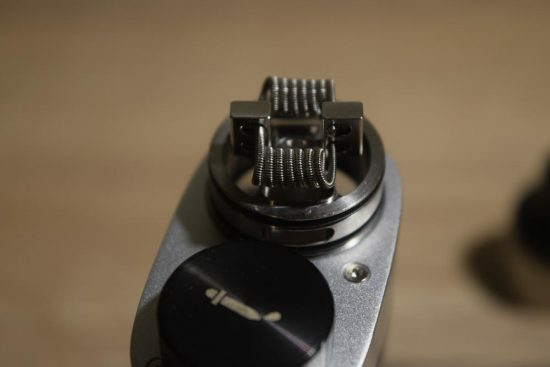 However, these coils are more than enough to get an idea of what the Skyhook RDTA Box can do. Setting up the device for your first vape is pretty simple. I started by cleaning the reservoir with water. You can probably fill it directly from the tap, although I don’t recommend it, but I prefer filling a small bottle with water and pouring it in the tank. Than just put the fill-port cap back on, cover the atomizer slot with your hand, and give a shake. Repeat the process until you feel it’s clean enough. As the name clearly suggests, this all-in-one device uses a custom version of the SMOK Skyhook RDTA. 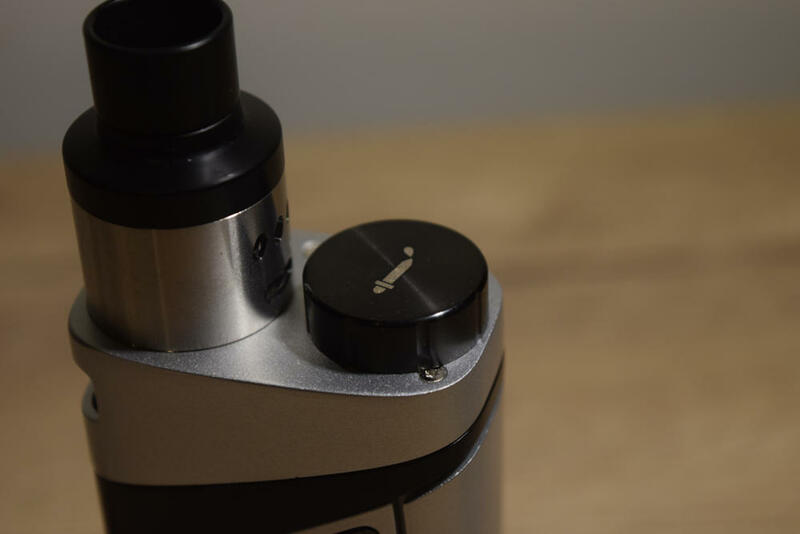 In my review of the standalone atomizer, I praised it for its vapor production and customizable airflow system, but I also mentioned the annoying filling problems. Luckily, the Skyhook RDTA Box takes the poorly placed filling slot and replaces it with a much more convenient one. So you won’t have to worry about the cotton leads getting in the way of your unicorn bottle anymore. Taking the tank apart is also much simpler this time around. Instead of having to unscrew the connection pin on the bottom with a screwdriver, now all you have to do is take off the RDA barrel and unscrew the build base (you’ll notice that it has a long connection pin that extends all the way to the bottom of the reservoir). That’s it, this thing is very easy to take apart and put back together. I’ve already talked about wicking the Skyhook RDTA in my original review of it, so I’m not going to go into great detail about it here. The only thing I would advise is to not leave the cotton leads too long, as that can actually make it harder for the juice to reach the coils. Just make sure that they hand inside the tank a little bit so that the juice reaches them when you tilt the box to vape. The best thing about both the SMOK RDTA Box and the original Skyhook RDTA is that you can play around with the different airflow options. 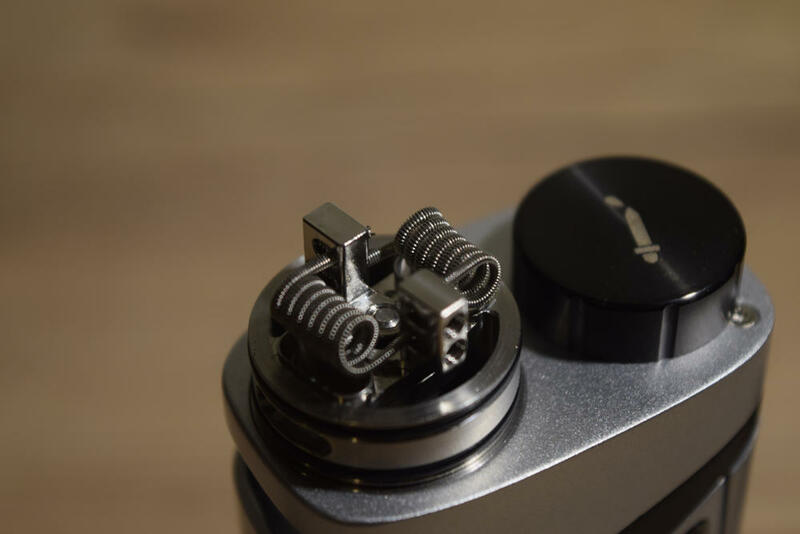 The pre-installed RDA barrel features both side and bottom airflow, but if that’s too much for you (it definitely is for me), you can swap it for the backup barrel included in the kit which only has side airflow. You can also use bottom airflow only by turning the Delrin top cap to block of the slide slots. There’s a lot of experimenting to be done with this device, and that’s always a plus. In terms of vapor production, this thing is right up there with the best devices in the industry. The enhanced airflow, combined with the high power output results in dense flavorful clouds of vapor that are bound to satisfy even the pickiest of vapers. Even with the custom coils, the massive plumes of vapor can become overwhelming at times, like when I chain vape and create this thick mist in my room. It’s like walking into a sauna. However, there is one department where the Skyhook RDTA Box falls heavily behind the iJoy RDTA Box, and that’s build deck variety. While iJoy’s device is compatible with its extensive line of replaceable build decks, allowing you to try different styles, from the classic Velocity, to Goon decks and even postless decks, the Skyhook box has only one deck style available right now, a Velocity design with floating posts. 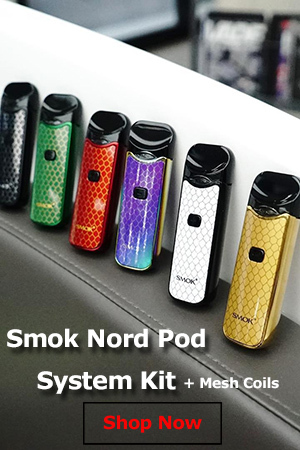 It’s good, but SMOK is going to have to come up with more if they’re serious about competing. Are they going to release any other deck options? 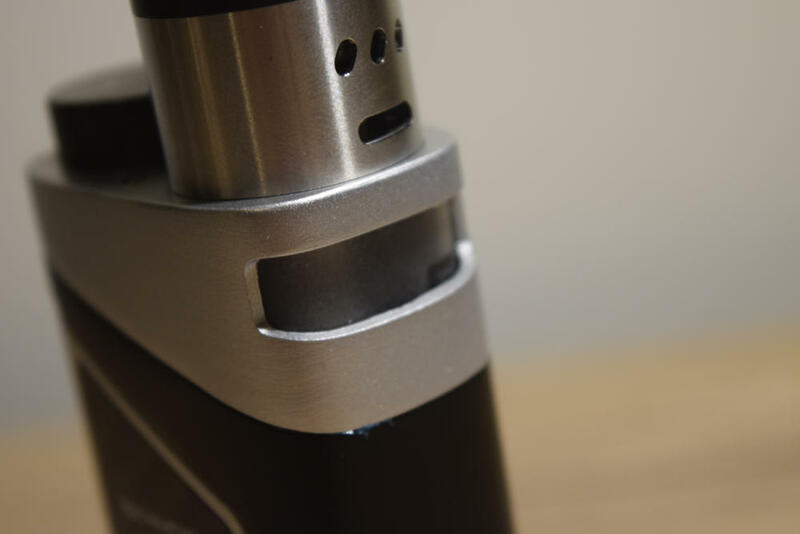 I have no idea, and I couldn’t find any info on this on the Smoktech website. We’ll just have to wait and hope. As a whole, the SMOK Skyhook RDTA has been a joy to use. I’ve experienced no leaking in the two weeks I have been using it for, maintenance is actually a lot less work that on a regular tank, and the Alien-like experience of the mod is a joy. There is almost no delay when pressing the fire bar, the buttons are nice and clicky, and the whole device just feels solid and great in your hand. The SMOK Skyhook RDTA Box has a lot going for it. The Alien heritage seems like enough to convince a lot SMOK fans to pull the trigger on this, and the convenience of an all-in-one device with a capacity of 9 ml of e-liquid is appealing as well. I definitely consider it better than the iJoy RDTA Box in terms of design and ergonomics, but I guess that ultimately comes down to personal preference. Power output is about the same on these two devices (220W vs 200W), but when it comes to customization, iJoy has the upper hand, thanks to its innovative line of interchangeable build decks. 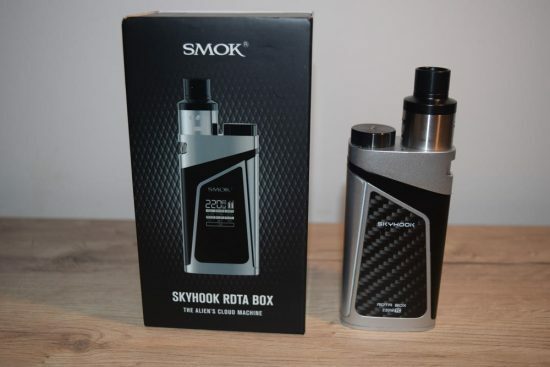 So, would I buy the Skyhook RDTA Box? If it was my first high-power all-in-one device, definitely. As I mentioned, it’s a great device that doesn’t really have any major flaws. 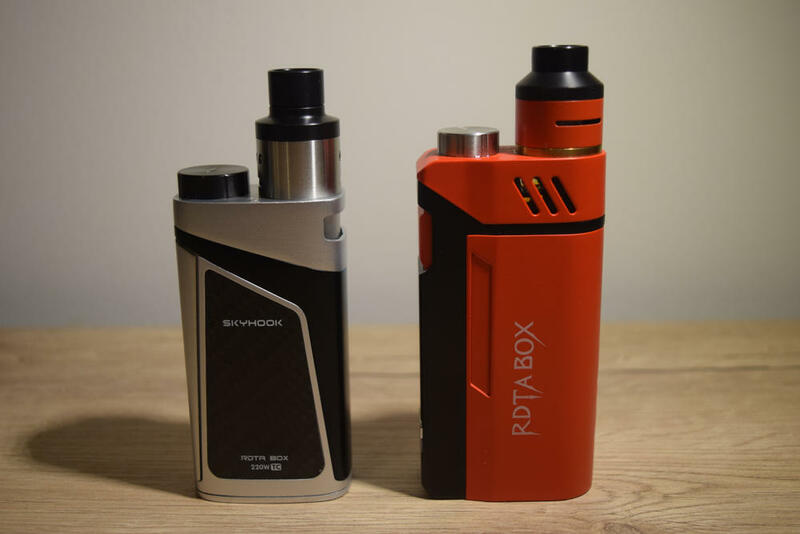 But if I already had the iJoy RDTA Box, I probably wouldn’t spend anymore money on a very similar device, just for the form factor or the interesting Skyhook RDTA. 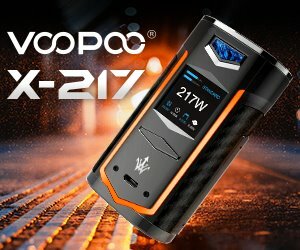 My opinion on this might change if SMOK came out with its own build deck collection for this device, but I’m not aware of any such plans yet. Comes with a floating Velocity twin post deck and man the holes through to the tank are ginormous so this thing wicks so well, dual claptons already installed from the factory so just a few glows then wicked her up and filled up with juice through the massive juice filling port straight from the bottle, no need for eyedroppers or needle point tips on ya bottle and instant fog machine. Comes with 2 atomizer tubes for multiple airflow options, so you can have bottom only, middle only or a combination of both air flow selections. I always thought bottom AF would give better flavour but I was wrong, I have the top air flow open fully and the bottom just cracked open slightly and the flavour is spectacular. I can’t believe how much cloud this thing produces and I’m only using one coil. I love the size and weight of this awesome little mod and the screen is so clear and full of info including Amps which is very handy for battery safety and it’s even got a PCB temperature readout… ! And when the screen turns off it all disappears behind a nicely dark tinted panel that hides it nicely. The simplicity of the chip is another huge plus, 3 clicks on the perfectly sprung Big side fire bar takes you straight to all the menu options and most of them you can set by a long press on the fire bar or flip through the options with a quick click on the fire bar. There’s two buttons just above the USB port for Up and Down so you can change the temp or watts directly from them without any need to go into the menu system and having the USB port on the side is a much better idea than underneath the mod. The mod is fully software upgradable so any updates can be done through the USB on a computer, it has a stealth mode for the screen as well as a lock mode so you don’t accidentally fire it in your pocket or bag. You can change the screen brightness and set the screensaver from 15 to 240 seconds. Has a puff counter as well as 22 memory presets fully customisable including Soft – Normal – Hard mode which is available in TC or Wattage and you can set the TCR to suit either NI, TI and SS wires. It has a built in Over Temperature for protection of You and your mod and a 12 second cutoff. The drip tip is removable and the top cap turns to adjust the middle airflow for that perfect balance of flavour. Turning the top cap anti-clockwise unscrews it so you can change the tube to swap it for the middle airflow only tube that comes in the box. The bottom battery door is perfectly flush with the bottom of the mod and it sits dead flat on a glass table solid as a rock just as it should be, when you open the door it is very clearly marked pos and neg so drop your batts in and close it up and away you go with no fuss. The window in the 9ml tank is made of clear frosted plastic but when the juice hits it, it goes clear which makes it really easy to see the level of your juice in the tank, it’s quite clever because the contrast of the wet and dry makes the level stand out really well without the need for an internal light in the tank. The combination of size and weight feels so good in the hand and for a 2 battery mod it’s perfect, the fire button is full length and is sprung just right and the way it sits in your hand is awesome with the tank facing you and the fire button opposite you don’t have to think about where the button is, just squeeze and Vape On….! The supplied coils are kanthal fused Claptons. One does not advise temperature control with that particular wire. had this MOD for a month, and had nothing but problems, I would not recommend this to anyone. what a waste of money. I’m on my 2nd once in two weeks now. Nothing but issues. I HATE IT!!! Worst product ever. Same experience I had mine for less than 30 days and then suddenly the screen stops working. I take the batteries out and put them back in and suddenly it looks like the digitizers out and is all scrambled. So I take the batteries out and put them back in this time the screen doesn’t turn on. I called the company that I got it from since I’ve only had it for proximately 21 days and they told me that I have to deal with smok to get a new one. It’s a horrible way to feel warranty request via the company that makes it rather than the store that sells it. Not to mention the massive amount of leaks that occur constantly, and finally the settings on my box would randomly change sometimes when I would turn it on and I would have to reset everything. I would never ever ever recommend this product to anyone else. I’ve only had mine for 2 days now but I love it! Awesome flavor, tons of adjustments, easy to fill, it just works! Had mine for a week now really nice mod, only downfall that my battery life is like 1 hour max? the same batteries last all day in my other box mod. I love it. It was on sale for $34.99 so I took a chance. So happy I did have made this my go to vape.